LOOKING FOR SOMETHING DIFFERENT AND UNIQUE AS A GIFT THIS YEAR? LOOK NO FURTHER WE HAVE SOME LOVELY ITEMS FOR SALE. DO YOU OR A LOVED ONE HAVE A PASSION FOR ALPACAS? - but are not in the position to buy one. HOW ABOUT ADOPTING ONE OF OUR LOVELY HERD? What a super gift - We can give you a gift voucher and then your loved one can arrange a visit to choose the alpaca they would like to adopt. 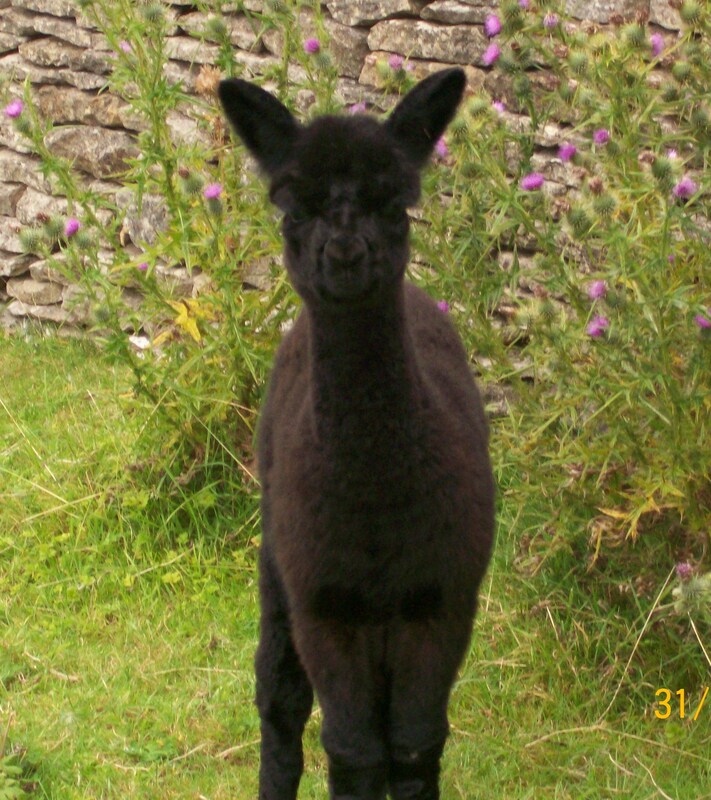 You will get chance to have private visits to see your adopted alpaca and the rest of the herd several times during the year and much more including the chance to take one of our alpacas for a walk around the farm. or you can ring Ginnie on 07702488118 for a friendly chat. 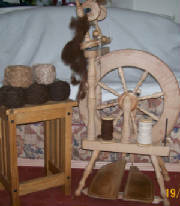 HOW ABOUT BUYING SOME SPINNING LESSONS FOR YOUR LOVED ONE? We can give you a gift voucher and they can arrange lessons at their own convenience. All lessons booked at Cotswold Vale Alpacas will include a chance to meet the alpacas and their babies up close and personal. Here's one for all those bird lovers. 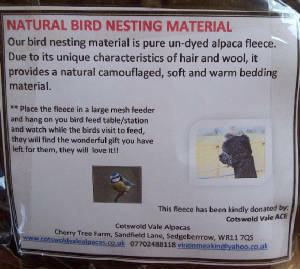 Our bird nesting material is pure un-dyed alpaca fleece, due to its unique charactaristics it provides a natural camourflaged, soft and warm bedding material for all your feathered friends. 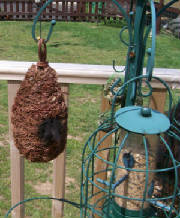 They love it, just hang it along side your seed feeders and when they next come for their visit they will find this lovely gift for their nests. 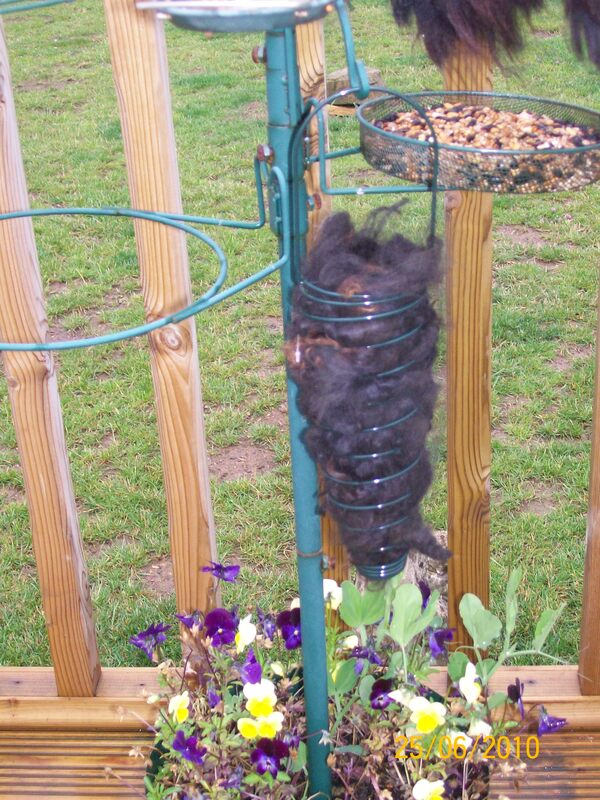 Natural Bird Nesting Material - if you already have a spare mesh feeder, why not just buy the nesting material, this will refill the feeder several times, lasting a vrey long time. £2.50 per 100g bag. We have available: Wire hangers or Wicker nesting pouches. All the bags are made from handspun wool from our own herd, are then handknitted and felted. Each one is unique and individual. Brown Felted Bag - this bag has been made from "Cotswold Vale Emily" and "Cotswold Vale Ispy"
This beautiful bag has been made from fleece kindly donated by "Cotswold Vale Ace" and "Cotswold Vale Ewen". The two boys have been kept back to use as stud male due their amazing fleece. The bag has been hand knitted from handspun wool and then felted to make an extremely softed felted bag. Sorry this bag has now been sold. Brown & Dark Fawn Felt Bag. This bag has been made with handspun wool from "Cotswold Vale Galaxy" and "Cotswold Vale Emily". Their fleece has been handspun, handknitted and felted to make this beautiful bag, it is extremely soft and is complimented by a wooden ball button. A unique one off item. The bag has been hand knitted from handspun wool and then felted to make an extremely softed felted bag, complitmented with a unusal mother of pearl black and white button. This beautiful bag has been made from fleece kindly donated by "Cotswold Vale Ewen". TEwen is one of our stud male, he has the most amazing soft and bright white fleece I have ever seen. 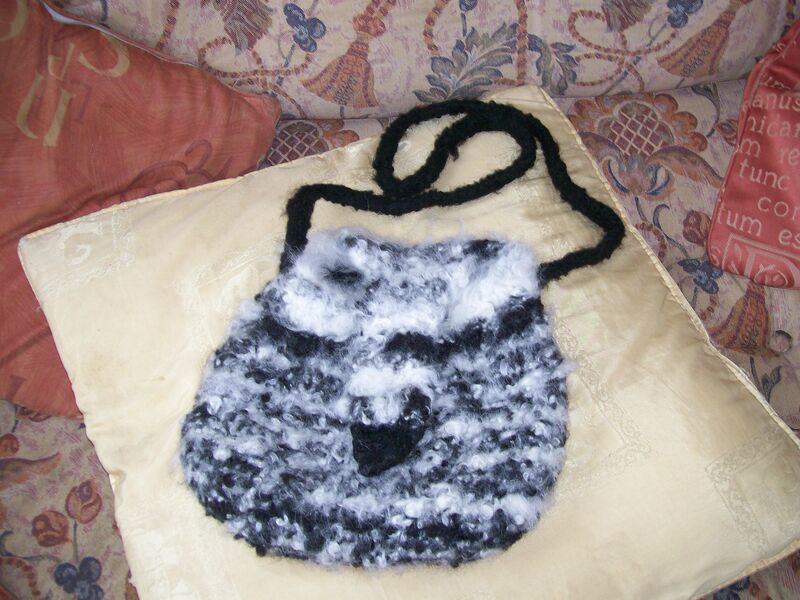 The bag has been hand knitted from fleece from Ewen, then handspun wool and then felted to make an extremely softed felted bag, complitmented with a unusal mother of pearl black and white button.